JPPM enjoys a productive relationship with Huntingtown High School and Social Studies teacher Jeff Cunningham. In previous years, Jeff’s archaeology classes, under the supervision of Education Director Kim Popetz, produced three cell phone tours for the park. The students worked on the audio tour projects at every level, including conducting oral history interviews, developing tour themes and scripts, recording the tours and writing press releases about the projects. This year, we decided to take on a different type of project, with Jeff’s new “Historical Investigations” class. The students are analyzing the contents of a mid-19th century privy from Baltimore’s Federal Reserve site (18BC27). Archaeologists excavated the site in 1980, but since the artifacts were never studied or a report prepared, the students are working with an assemblage that has never before received any attention. Before indoor plumbing became common, small outdoor structures set over brick-lined pits served as toilet facilities for many urban households. Such pits became convenient dumping places for household garbage in the days before city-wide trash pick-up. This particular privy is filled with broken plates, spittoons, chamber pots, medicine bottles, and a torpedo bottle once used to hold carbonated beverages. 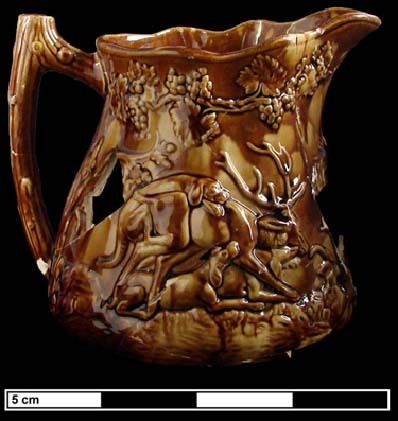 One spectacular find from the privy was a large brown and yellow pitcher depicting a boar and stag hunt, made around 1855 by a Baltimore pottery firm. hounds attacking a stag and a boar, was manufactured around 1855 by E.
So far, the students have cataloged ceramics and glass – over 600 artifacts and counting! In coming weeks, they will tackle food bone, seeds, and personal artifacts like buttons and tobacco pipes. They seem to be most looking forward to gluing the broken dishes and bottles back together. Once they finish the mending, students will choose objects to research in depth. The results of their research will culminate in an exhibit of their findings. It’s exciting to work with students on a project that provides them with real world experience in a supportive setting, conducting the type of analysis normally done by professional archaeologists. Even better, is watching the students get a thrill from each new artifact and the information it holds. 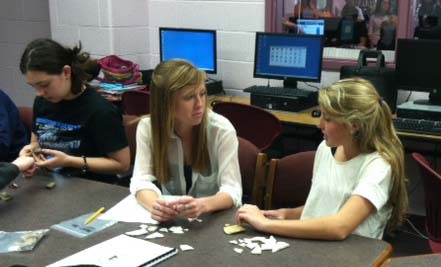 This entry was posted in Archaeology, Artifacts, History and tagged activites, archaeology, artifacts, baltimore, hands-on activities, history, huntingtown high school, student. Bookmark the permalink.